Growing the difficult, strange, or unusual. Now in the wacky state of Florida! I don't live close to any orchid nurseries, despite living in Florida. I do live close to a garden center that gets it's plants from nurseries that carry unique things. Every so often they get in plants from E.F.G. Orchids in Deland. I love seeing those blue tags at a store down the street. Once or twice a year I'll make the trip out to Deland when I feel like really spending some money. E.F.G. Orchids is fantastic. As in, always has good choices, always has decent prices, always friendly and helpful staff great. It's probably great that I don't live closer or my wallet would not look so great. Phalaenopsis bellina...with a keiki. I'm hoping this one blooms a little different than the one I already have, F5 from Ooi Leng Sun. Angraecum sesquipedale...needed one of these, why don't I already have this? Looking at it from the back, there's a keiki. Let's talk for a minute about Phal, Sogo Yenlin "Golden Coffee(?)" Coffees(?) Coffey(?) Striped Coffee(?) I asked about these as they had a variety of labels and sizes. I've seen them labeled all those ways elsewhere. They all bloom the same. Apparently they are all the same. The most info I could get about them is these were from I-Hsin labs to a distributor in Apopka, to E.F.G. Apparently a lot of people have been finding them at their local Lowe's too. I bought this one because the variegation is the strongest I've seen on these. The numbers on the tag is the same as my Coffee as well. No amount of Googling has turned up a definitive answer for the right name for these guys. Fdk. After Dark 'Black Pearl' has one of the blackest flowers I've seen. There is no such thing as a black flower in nature, but brown, red, or purple so saturated it looks black. The darker color also has to do with cultural conditions, or so I've read. Warmer temps will bloom a lighter burgundy. Nothing else with "black" flowers grows well here, (or not for me anyway) so I had to try it. I'm hoping our nights are cool enough now for it to flower dark enough to look black. Like real dark black, blacker than space. Angreacum sesquipidale. I was just watching an orchid haul video the night before I went to E.F.G. where a woman had found one in those Better-Gro bagged orchids and I got jealous. I feel like the universe is trying to tell me something by letting me find one the next day. Have I been good? So, I originally recorded a video haul, because I love watching other people's hauls and unboxings on YouTube. Plus it really shows you the quality of plants you can expect. I can't hold the camera steady and am coughing because I'm getting over a cold still, so it turned out crappy. Maybe next time. 2016 Was a pretty good year for my orchids. I know this because many bloomed, many need to be divided or go into larger pots. However, I didn't do much to deserve the growth or flowers I got. I maybe fertilized them twice the whole year. I turned the hose on them when it hadn't rained for a few weeks. They got too much sun when some trees came down in the back yard. One Vanda (I forgot I had,) I left hanging on a fence in full sun and basically never watered or fertilized it. It's leaves are a bit sunbleached, but it's roots look fabulous and it's still putting out a new leaf. I've been doing a million other things and was much more focused on my bromeliads and Nepenthes. All it took was one new Phalaenopsis and we're back in the game. I know, a Phalaenopsis?! The grocery store orchid for the masses? Gets marked down to $1 when it drops it's flowers? Get's thrown in the trash when it's done blooming? How plebian, Ick. I'm really, really invested in this Phalaenopsis gigantea in particular. I need it to be a monster one day, so whatever happens I cannot kill it. I even bought some larger clear pots to repot this guy out of moss. It's a slow grower, but has definitely grown between the times these pictures were taken. That set off a slight binge in buying some species and higher end hybrid Phalaenopsis. I don't regret it. My cheap hybrid mini-Phals bloom every winter. My Phal 'Purple Martin', (a violacea hybrid) blooms on and off, all summer, every summer, since I bought it. That's a spike. And yeah that's dust/dirt/debris on slightly dehydrated leaves. So here's to Phalaenopsis. The generic, cheap first orchid many of us killed. For me, the majority of my 2016 orchid purchases. The orchids that are the nicest to me despite me neglecting them for nearly a year, so it appears I do owe them. Thanks to that Phal. gigantea in particular for renewing my interest in orchids. Does a new purchase ever do that for you all as well? I took a long break from posting, here and elsewhere in the plant growing communities. I needed to take some time away for a variety of reasons. I was considering deleting this blog the other day, but I miss the positive aspects of sharing photos, ideas, and the meaningful conversations I've had with people from all over the world with similar interests due to having it around. I'm choosing to focus on the positive things. Like the fact that some of you emailed or sent me messages on Instagram and I truly appreciate everyone who kept in touch. I think I've caught up on all the comments on here as well. I've some damage to a few of my plants, and some didn't make it due to Hurricane Matthew. So I'm working on growing really happy plants while a construction crew fixes the more important things damaged, such as the roof of our house, ceiling of the bedroom, etc. S. minor, Orange County FL. There are a ton more buds coming up and of course pitchers! Bromeliads are considered a "keystone species," meaning they're important to the survival of a variety of living organisms in their environment. The "tank" that the leaves form gets filled with water that not only does the plant use, it creates a habitat with food and shelter for animals, insects, microorganisms and even other plants. I won't get started on here into the estimates of how many gallons of water an acre of a forest containing bromeliads can hold, estimates on how many organisms they support. The point being is they help and in some cases exclusively support life around and in them through some complex co-evolution. Now here in my tiny corner of the world, they aren't so important, but they appear to be of value anyway. Quesnelia marmorata 'Tim Plowman' has been home to this particular frog since I moved it outside for the summer. This Anole lizard was hiding in and about them catching bugs the other day. He blends in pretty well with this green Hohenbergia too. I've developed a bit of a collection, and recently moved them all outside for the summer again. I love that animals are enjoying having them here too. The genus Hohenbergia might just be my favorite. View from above, l love the long tubular shapes these make. One of my favorite features in any genus is spines. The more careful you have to be when repotting the bigger a fan I am of the plant. This one murdered my arms trying to get it from the store to my car and back out to the yard again. It was meant to be. This Aechmea nudicaulis 'Parati' is a new one I recently potted up. Aside from features like spiked leaves, one of the best parts about growing bromeliads is how easily they can be shared and shipped. After the main plant flowers, it'll make offsets, or "pups" to propagate itself and the mother plant will eventually die. Some mother plants make pups before flowering, like this one, and should make a nice clump of plants over time. By now you've probably noticed the chopsticks throughout these photos. The ones that had arrived without roots are staked in place with them. It works perfectly to keep them stable while they root, as you can't bury the base of the plant without risking rotting epiphytic bromeliads like this one. There are some bromeliads that make pups often and form nice looking clumps more easily than others. If you have the patience, starting with one single pup can be a super cheap way to start what will be a nice clump of plants like the above eventually. With such easy maintenance and many being cold tolerant enough to stay outside all year here, (seriously, my Home Depot Vriesea hybrid tolerates the occasional frost,) it's hard not to wind up with a serious collection over time. Lets start with the mini Phalaenopsis. Dtps. Sogo Vivien variegated. The plastic pot broke, probably due to the heat and sun of growing it outdoors, so it needs repotting so bad it isn't funny. Dtps. Sogo Vieker 'Taida Little Monkey', flowers got a bit bunched up and wacky. Unfortunately had to move it in from outdoors when the temps started to get too low at night, after it had already started blooming so now it looks a mess. 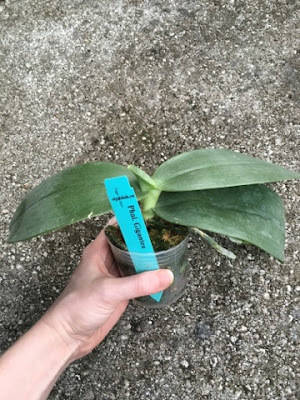 NoID mini Phal. Same problem, oh well. Cattleya lawrenceana 'El Hatillo' x 'Manantial' decided to push out some more flowers. Also that's definitely not an old store display rack I use to grow some of my orchids on. Cattleya Caribbean x lawrenceana. I've been patiently waiting on this one to bloom since I bought it in 2014. It's an H&R cross according to an older sales list. This also may be the 1st photo on the internet of the bloom as I can't find a single other. Last but certainly not least, Dendrobium. Dendobium moniliforme 'Himeginsetsu'. This one's been blooming since fall, same as last year, what a great mini. Lots more in spike, including my one of my favorite Cattleya species, so it should be a good year for orchid blooms! 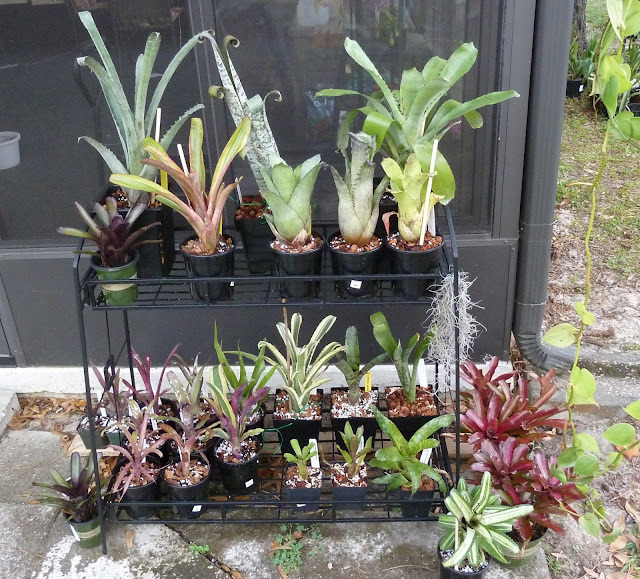 I'm growing mostly carnivorous plants, orchids, cacti, and other interesting plants inside and out, in Northern Florida, (previously apartments in FL and NY.) This blog will mostly be about stuff related to that. Blogs I Follow, Check Them Out! Autumn 2019 roundup – its been hot, hot, hot! What’s the best thing about summer? A carnivorous plant giveaway!